The Dalai Lama will be presiding over a mass conversion of Dalits in India. 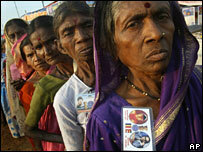 Up to 100,000 Dalits will convert, perhaps the largest mass conversion in modern history. Interestingly, many Dalits have also converted to Christianity. These conversions are often motivated by Dalit hope in escaping the “untouchable” caste life. Emerging Harvard Philosopher: What Does it Mean to be Human? Kelly has three books on the way, which he plans to complete in the next year. See Harvard interview here. Tacks, The Boy Disaster is an emerging Austin band with a incomparable sound. Oh, Beatrice is a unique combinatino of pleasantly haunting piano keys, delicate yet deliberate vocals, and steady beats–thoroughly enjoyable music. Check out their mySpace site and stream four songs for free. “Frozen Feet” is more upbeat and “Paris” slower. These guys have a great sound. War on Terror Falls Short: Burma! One of the problems with the global war on terror is that it is not global. Instead, it is focused on strategic areas of U.S. political interest. 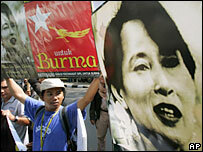 For instance, the military dictatorship in Burma has ruled the country in corruption and with an iron fist since 1988. One example is the recent imprisonment renewal of Nobel Peace Prize winner and democratically elected leader Aung San Suu Kyi. She has spent the last 11 of her 18 years under house arrest. From my trips to Burma, I can attest that the country is in gross disrepair, while the new capital gleams with wealth. Dictator General Than Shwe rules the country with oppression and genocidal acts, systematically trying to wipe out indigenous rebels. Pray for Burma, for Sun Kyi.